'Hinton Compatriots' - questions, answers and considerations! These are the first samples from the master mold - on the way to me now! As I thought before I decided to produce the new range - Folks will all have there own specific needs/wants and it would be difficult to produce everything that everybody needs. That's why I picked items I wanted first! However if enough people ask for similar items then of course they get done first! Yes the bases are different to HH - I had discussed this with the sculptor earlier - the animation is severely restricted on the smaller base - as you can see from the comparison shot of bases on the earlier post. I have also a problem with deciding how to set up the molds - again folks all have different requirements and use different rules which dictate different number scales for their unit sizes - i.e 12/18/24/36/48 per battalion. Also some like the officers/pioneers/drummers to not be in the line as it were and have them stand separately. I do not want to produce figures willy-nilly! so I am trying to be efficient with the figures in the mold to minimize the number of runs. As an example I use a overall figure scale of 33:1 and based on lots of research average battalion size in the field of 600 rank and file for my French infantry. Also the biggest problem with ground scale is the depth of the figure which is why I only ever use single line stands. I also had decided to make each Regiment consists of 2 battalions. Now this just happens to be great for the mold size - I could put the 22 fusiliers, the Drummer and the Ensign together with 2 officers onto one mold of 26 figures very comfortably. 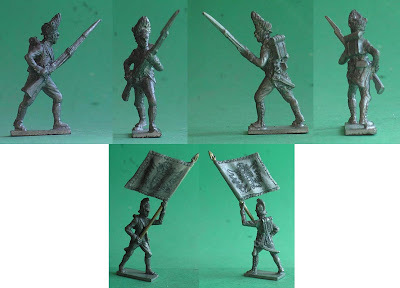 The Grenadiers and Voltigeurs would also have there own 2 battalion mold. The same 600 rank and file average sized battalion is also used for the British (albeit in 10 x 2 casting companies plus Officers) - so again the battalion fits well onto a mold. With the the Austrians - we have much larger average sized battalions at least double the size of the French! so they do not fit onto a single mold - Roy uses 48 figures for the Austrians - I use 36 (6 x 6 casting companies - 1200 man battalion). Also again I put all the various figures onto the coy bases except for 2 officers per battalion - which would make a 38 figure battalion - this would mean one and a half molds (or 2 molds for Roy's 48 sized battalions). Thus my dilemma! What size battalion would you/do you use for Austrians? Would you put Drummers, Pioneers, Ensign, NCO's and Officers on the coy base? How many of them would you use per battalion? After Advancing (High Port Arms) what pose would you prefer next for line troops - Attack Marching, Firing, Kneeling, Charging(Low Port Arms - other? 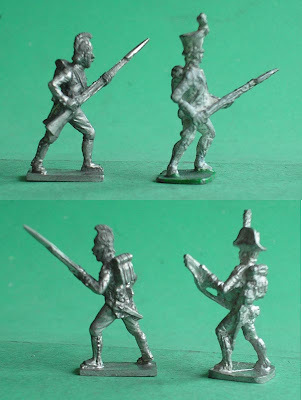 I am pleased to show below the first figure masters of my new Hinton Hunt Compatible Napoleonic Range. The range has been named 'Hinton Compatriots' to signify the compatibility with that range. The first set of six figures comprises: Fusilier, NCO, Drummer, Pioneer, Officer and Ensign of the Austrian (German Regts) in Helmets. The final flag carried by the Ensign will be engraved with the Austrian 1792 Ordinarstandarte. My objective with the range is to make available to myself (and anybody else that is interested) a selection of figures of different nationalities that are Hinton compatible and help fill the many gaps that now exists since the Hinton Hunt range is now defunct and any available figures are scarce, poor quality and expensive. The next series will be as above but Hungarian regiments in Helmets - Advancing to compliment the first series. The production plan includes Grenadiers, Jagers, Mounted Officers and Cavalry, Artillery Crew and Guns/Limbers. The Infantry will also be produced in a Charging, Marching and Firing series. 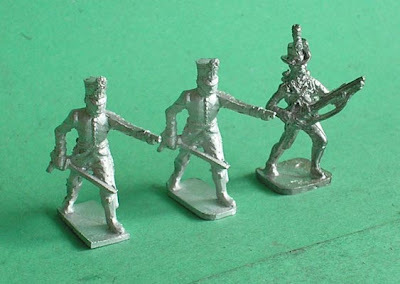 I am also considering doing later infantry with shako's subject to demand to complete the Austrians. Each series will include all the elements of the battalion as the first does. Other nationalities are also being planned - Including British in Stovepipes and Early French. I am open to suggestions and requests however. Anybody interested please contact me with requests, commitments, orders etc. I will be able to set pricing when all the bills are in! I should state that I do not wish this to be a full blown money making business and I am planning just to recover costs with pricing. I also may only be offering in battalion sets at first since the molds will be set up that way. I currently expect the first set of figures to be available in about 3 weeks. In response to why not same base size as Hinton - Sculptor thinks (and I) agree the small square base restricts the pose animation and results in some unrealistic stances (Can you say oops - soiled breeches again!). Attempting to round off new base from square was unsightly - thus the base we use. And yes that's an officer master for the 'shako' range being contemplated.